The Pinkies’ dazzling post-show party! 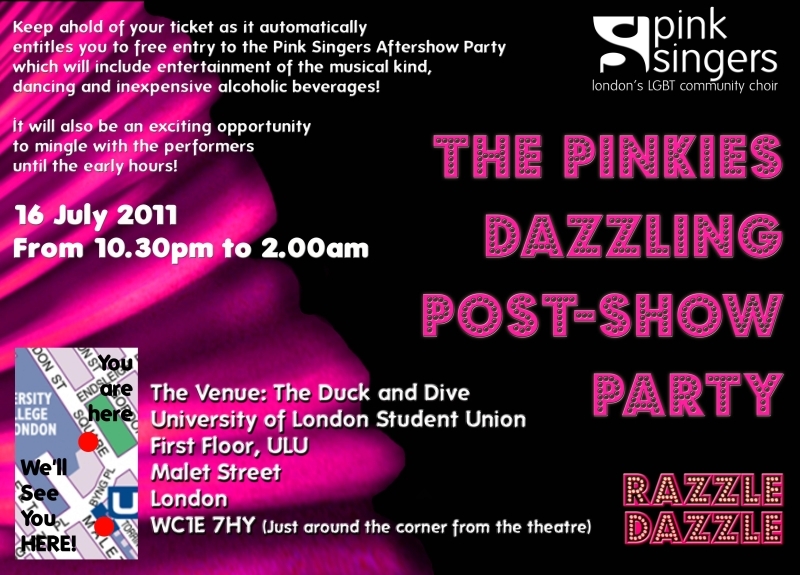 Not that you need any more excuses to come to Razzle Dazzle this Saturday, but did you know that your ticket also gets you entry to the Pinkies’ dazzling post-show party? We’ll be in the mood to celebrate, and hope that you will be too. It is your chance to mingle with the Pinkies, share a drink and even sing a song or two. And if you are interested in joining us, you can find out first hand what it is like to be a member of London’s LGBT community choir. Keep an eye out for Gary or ask any Pinkie! Previous Previous post: An advance Razzle Dazzle thank you! Next Next post: A glimpse of stocking was rather shocking!